This week’s secret ingredient is Summer Squash! There are many varieties of summer squash. I like the yellow Constricted Neck variety but there are also Scallop or Patty Pan and Cylindrical to club-shaped Italian marrows. Because they are the relative of the Zucchini, their nutrition facts are the same. Summer squash are harvested when they are small and the skins are still tender. They also have the best taste when small so stick with small summer squash. Stay away from soft however, they still need to have substance. Store the squash in your refrigerator until ready to use. At that point wash and dry them before preparing your dish. Don’t keep them for too long, as it doesn’t take long for them to deteriorate. Summer squash can be grilled, steamed, boiled, sauteed, fried or used in stir fry recipes. I love them tossed into a pan with other summer vegetables like tomatoes, zucchini, peppers and onions and lots of basil or rosemary. If you add a little protein like quinoa pasta you have a complete meal. 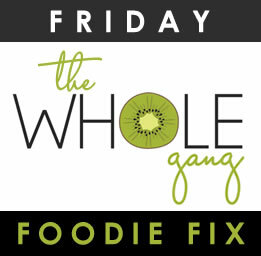 Next Week’s Secret Ingredient for Friday Foodie Fix is … Tomato! Now it’s your turn to share your gluten free recipes with summer squash below. I'm glad you liked my cucumber lemonade. I've been using my juicer a lot and like putting cucumber in that. Unfortunately, I don't have a summer squash recipe. My family doesn't like it much but they love zucchini so I stick with that. I'm sure I'll have a tomato recipe or two to link next week. Linda juicers can be a lot of fun. Coming up with new combos that might not have thought about before but when you give them a try it's great. Keep juicing and keep sharing recipes! ps, if you could remove the blender sauce….although you can use zucchini, it is more of a tomato recipe, better for next week probably! 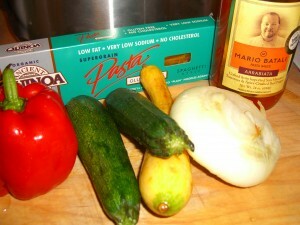 This week I am sharing a summer squash pasta dish. I made is last summer, everything from the garden – except the brown rice pasta of course. Amber I thought that pesto cucumber was very creative. I've got the ingredients now to make some. Can't wait to try. Thank you for sharing again this week. thanks so much for hosting! this week, i shared my Zucchini/Summer Squash Fries! They're Gluten Free and Body Ecology Diet friendly!